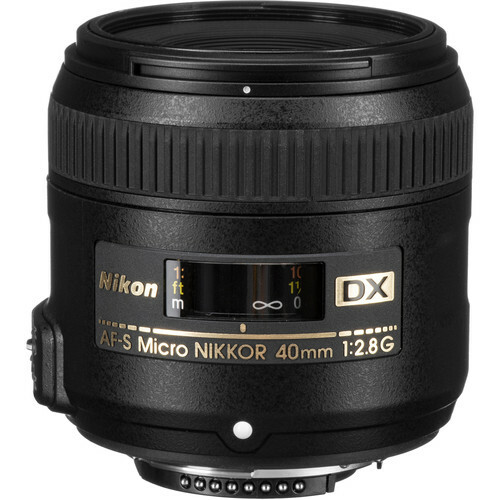 Excelling at close distances, the AF-S DX Micro NIKKOR 40mm f/2.8G from Nikon is a 60mm-equivalent macro prime offering a 1:1 life-size maximum magnification along with a 6.4" minimum focusing distance. Benefitting both close-up shooting as well as working at greater distances, the optical design uses a Close Range Correction system that maintains consistent image quality and sharpness throughout the focusing range. Individual elements also feature a Super Integrated Coating, which suppresses flare and ghosting for greater contrast and color fidelity and harsh lighting conditions. Additionally, complementing the imaging capabilities, a Silent Wave Motor affords fast and precise autofocus performance, along with full-time manual focus override, to benefit both stills and video applications. Slightly longer-than-normal prime is designed for DX-format F-mount cameras and provides a 60mm equivalent focal length. Ideal for macro shooting, this lens offers a life-size 1:1 maximum magnification along with a minimum focusing distance of 6.4" to suit working with close-up subjects. Silent Wave Motor affords quick, quiet, and precise autofocus performance along with full-time manual focus override. AF-S DX Micro NIKKOR 40mm f/2.8G Lens is rated 4.8 out of 5 by 302. Rated 4 out of 5 by MDSantos from Pretty Good Lens I use this on a new D7100. It has proven to be my favorite lens so far, it takes great profile and portrait photos. It worked great in low light, though it is SLOW to focus. I did manage to get a few good pictures at the National Aquarium. I was surprised how well it did in low light, though I had my ISO set at 6400 most of the visit. I would buy this lens again, I only gave it 4 stars because it is slow especially at a fast paced rate like viewing a very busy aquarium on the weekend. I have attached a few pictures, one a portrait taken quickly, and the others are at the aquarium. All are UNEDITED. Again, I used a new D7100. Rated 4 out of 5 by Michael from Extremely Sharp Lens This is a great lens. It works well for portrait or anytime you want natural perspective. The 2.8 aperture renders nice blur to backgrounds. You'll want to stop down the lens if shooting macro to assure all of your subject is in focus. This is a good lens and well priced for macro. But understand that at 40mm, to photo at 1:1 your subject will only be about an inch from the front of the lens. So lighting is more difficult and critters may bolt. I use the included lens hood to keep from touching things I photograph, the lens can focus that close. It's a good lens for many uses and very sharp. The focus ring is firm and feels solid when manually focusing. Rated 5 out of 5 by Mike from Sharp & Versatile The 40mm f/2.8G is a great little lens. It can be used for portraits, close-ups, macro, landscape, etc. It can create extremely sharp photos or photos with incredibly rich bokeh, depending on how you use it. If you use it for macro photography it is almost essential that you use a tripod and even better if you can add a flash. 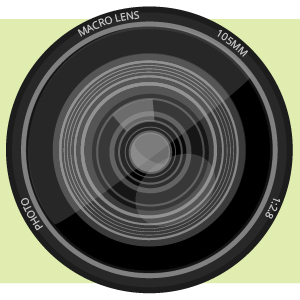 I've been primarily using it for non-macro close-up photography, which is an area where this lens seems to excel (e.g. between 6-12 inches from the subject). When using it for close-up shots I've been using the Lite-Scoop flash modifier and a manual flash attached to the shoe, where the Lite-Scoop is pointing to the ground (it's not really designed for this...but it works great). Rated 5 out of 5 by Photo Nut from It was Love at first use!! I use this lens for close ups of flowers, insects, & many other shots. I am 69 years old & many years ago I had a 35mm camera with all the lenses & it took nice shots, & for my close ups I used the 3 attachment screw on close up lenses, but this is a lot better than trying to figure out what of the 3 I needed. I use this with my Nikon D3100 & it works perfect. For the average shots I take I usually use the 40mm f/2.8 AF-S DX Micro-Nikkor Lens. I have to say I wish they had all this digital stuff when I was younger, I would probably be a Pro Now, but I am just average at it all. But would recommend this lens to anyone & for the price, there is no way it could be beat. Rated 4 out of 5 by Phil from Works with DX Body and ES-1 I bought this specifically to copy slides with the Nikon ES-1 and my D7200. It works perfectly for that even though Nikon does not specifically recommend it. No other adapters or rings needed. I already have the Nikkor 105 VR, so I was going to sell it when I'm done copying slides. But...I may keep it. It makes a super compact and light 40mm (60mm equivalent) f/2.8 on a DX camera with 1:1 capability. I did not give it 5 stars only because the barrel extends when you get into close focus, unlike the 105 which is internal. But...it's 1/3rd the price so what do you expect? Good value! Rated 5 out of 5 by Brett from Incredibly Sharp I purchased the 40mm as a daily lens with macro capability for my Nikon D7000. Focus is fast, accurate and quiet at both minimum focal length and infinity, however it hunts a little bit in VERY low light. Infinity picture quality is incredibly sharp at f4-f5 (sharpest of all my lenses, even more than my 35mm and 60mm), while macro is sharpest from f4-f11, depending on the Depth Of Field you want. DOF is incredible with amazing and pleasant Bokeh. I have taken a few hundred photos with this lens so far and I am more than satisfied. Rated 5 out of 5 by Abraham from Steep learning curve! Don't listen to all the hate the gearheads give this lens; the results are fantastic. It has beautiful bokeh, it's sharp wide open at any focusing distance, virtually distortion free, and it has a razor thin depth of field at 1:1 magnification. The only drawback is color fringing beyond the plane of focus; the foreground will have magenta fringing and the background will have green fringing. (noticeable only in very few circumstances) Tech freaks will tell you it's a bad lens (without ever laying a hand on it) because at 1:1 the front element will be 3cm away from your subject and block your lighting because all they know how to do is use their pop-up flash. Put your speedlight in commander mode and get creative or just buy a Nikon R1C1 kit and you'll have beautiful macro shots at a bargain price! Does this lens include a hood, or must I purchase one? Yes, this lens is compatible with the Nikon D7200. Yes it is a Macro and a general purpose lens as well. It takes excellent regular photos. Does this work for the D750? As this is a DX format lens, it will vignette on a FX format camera such as the D750 unless it is used in crop mode. Will this lens work with a Nikon D-5000 digital SLR? Yes, the Nikon 40mm f/2.8 AF-S DX lens will work with the Nikon D5000. Is this lens also compatable with the discontinued Samsung NX1000? If not, what would be a reasonable substitute? in order to use this lens with the samsung, you would need a Nikon F to Samsung NX adapter, and would be totally manual focus and unable to control the aperture as the adapter does not continue electronic communication between lens and camera. The Company Rokinon still makes lenses in the NX mount for the discontinued Samsung cameras, so those may be a reasonable substitute. I have to choose between Nikon's 40mm f2.8 micro and 50mm f1.8 for using with D5200. which is better? I am more into portraits than macro.How do these compare from portrait point of view.Is the 40mm really good for macro?looking for expert opinion on this. For portraits, the 50mm f/1.8 lens will be an ideal choice, as when this lens is used on a DX Format camera such as the Nikon D5200, you will get an angle of view closer to 75mm, whereas the 40mm f/2.8 AF-S DX lens will give you a more standard focal length of 60mm. The 50mm will also give you excellent bokeh, while the 40mm f/2.8 will be a better choice for close-up focusing. Does this lens have a metal mounting ring? I just received this lens, and yes it has a metal mounting ring.